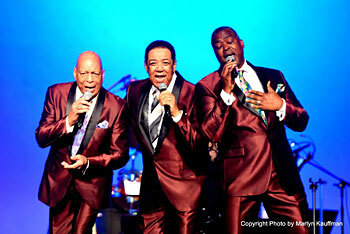 The Flamingos | Concerts At Sea 50s & 60s Themed Oldies Cruise - Where The Action Is! Billboard says The Flamingos are universally hailed as one of the finest and most influential vocal groups in pop music history; their music being defined as elegant and sophisticated. As the group celebrates its diamond anniversary, with their newly released CD, the Ambassadors for Romance are better than ever. Led by Rock and Roll Hall of Fame inductee Terry Johnson, The Flamingos stay true to their roots by performing their greatest hits including, “I Only Have Eyes for You,” heralded by The Rock and Roll Hall of Fame as a song that helped define rock and roll. Terry Johnson is lead singer, writer and arranger of The Flamingos’ most successful music then and now. As a seasoned performer and former writing and producing partner with Smokey Robinson at Motown Records, his Vegas style shows always provide quality entertainment. The performers with Terry Johnson are dynamic entertainers in their own right and bring The Flamingos presentation into today’s market. In live performances, The Flamingos expand their repertoire to include classic songs from the American Songbook arranged in the unique “Flamingos” sound. This mix of classic songs, video presentations and dancers makes for a memory-filled concert that brings fans to their feet repeatedly. most watched YouTube video in the 25 year history of the Florida Lottery. 4) Hit song used in TV shows – Glee, Buffy the Vampire Slayer, Vegas and many more. 5) Hit song used in movies – Something’s Gotta Give, Bronx Tale, American Graffiti and more.